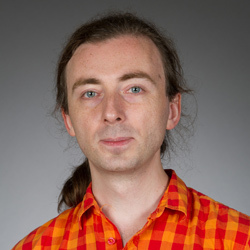 Pavel Mnev, a new topologist at the College of Science in the department of mathematics, has been awarded The André Lichnerowicz Prize in Poisson geometry. The biennial award is given for outstanding work by a young mathematician in Poisson geometry. “I am very much honored by the award. It is most encouraging to be recognized by such a respected international research society,” said Pavel Mnev. The André Lichnerowicz Prize is named in memory of André Lichnerowicz (1915–1998) whose work was fundamental in establishing Poisson geometry as a branch of mathematics. Mnev, an assistant professor in the department of mathematics, received his Ph.D. in 2008 from the St. Petersburg Branch of the Steklov Mathematical Institute of the Russian Academy of Sciences under the direction of Ludwig Faddeev, a group that is credited with a number of crucial developments in modern theoretical and mathematical physics. Mnev held a postdoctoral position at the University of Zurich and was most recently an advanced researcher at the Max Planck Institute for Mathematics in Bonn, home of the world’s preeminent group working on applications of topology to physics. Mnev has been favorably compared to several senior researchers at top institutions, and brings much-desired expertise to the department of mathematics. Originally published by Tammi Freehling at science.nd.edu on August 29, 2016.